In good news for the Bordelon family, the Queen Sugar TV show has been renewed for a third season on OWN. Season two just premiered on June 20th. In addition to the renewal, OWN has announced a new first-look deal with Queen Sugar creator, Ava DuVernay. The cabler also announced that Michael Michele, Roger Guenveur Smith, and Beverly Todd will recur later on in season two. 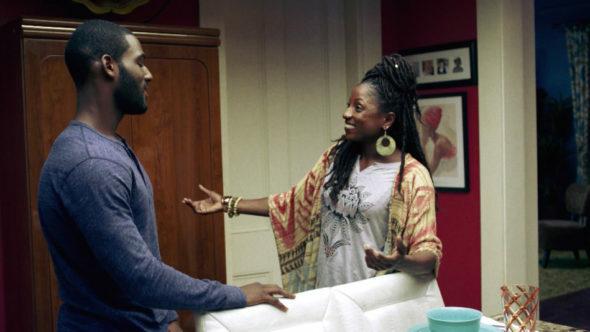 An OWN drama series, Queen Sugar stars Rutina Wesley, Dawn-Lyen Gardner, Kofi Siriboe, Tina Lifford, Ethan Hutchison, Nicholas L. Ashe, Omar J. Dorsey, Dondré Whitfield, Timon Kyle Durrett, Greg Vaughan, and Marycarmen Lopez. The story chronicles the lives and loves of the estranged Bordelon siblings. Following a family tragedy, they reunite in order to save the family sugarcane farm. The second season of Queen Sugar is averaging a 0.51 rating in the 18-49 demographic with 1.72 million viewers. Compared to season one, that’s even in the demo and down by 3% in viewership, respectively. Learn how Queen Sugar stacks up against other OWN TV shows. Learn more from this OWN press release. Los Angeles – Oprah Winfrey’s Harpo Films announced today it has partnered with award-winning filmmaker Ava DuVernay (“13th,” “A Wrinkle in Time”) on a first-look deal for television and digital media. The first collaboration is DuVernay’s recently announced limited drama series “Central Park Five” for Netflix from Participant Media, Tribeca Productions and Harpo Films. Additionally, OWN: Oprah Winfrey Network announced it has renewed for a third season DuVernay’s critically acclaimed original drama series “Queen Sugar,” from Warner Horizon Scripted Television. “Queen Sugar” (Wednesdays at 10 p.m. ET/PT) chronicles the lives and loves of the Bordelon siblings in Louisiana and recently debuted its second season on OWN (June 20) with its highest-rated episode ever in key adult and female demos. The series is currently averaging 2.4 million viewers (L3) and is consistently one of the most talked-about shows on social media. In addition to announcing “Queen Sugar’s” third season order, OWN has announced that Michael Michele, Roger Guenveur Smith and Beverly Todd will join the series in recurring roles later in season two. Michele (“ER,” “Kevin Hill”) and Smith (“A Huey P. Newton Story,” “Do the Right Thing”) will play Darla’s (Bianca Lawson) estranged parents, and Todd (“I Will Follow,” “The Bucket List”) plays Mother Olivia Brown, a much beloved and respected matriarchal activist residing in the 9th Ward. Following a creative initiative established at the series’ outset, DuVernay continues to assemble an all-female directing team. Making their television episodic directing debuts with “Queen Sugar,” Garrett Bradley (Sundance award-winning director, “Alone”), Liesl Tommy (Tony-nominated director, “Eclipsed”) and Christina Voros (acclaimed cinematographer and director “The Ladies,” “The Director”) will join previously announced Julie Dash (Sundance award-winning “Daughters of the Dust”) to direct upcoming episodes of the second half of season two, airing this fall. Filmmaker Ava DuVernay was nominated for an Academy Award and won the BAFTA for Best Documentary for “13th” which had the honor of opening the New York Film Festival before premiering on Netflix. The documentary showcased her commitment to activism and reform in the criminal justice system. Previously, she directed the acclaimed feature film “Selma,” which was nominated for two Academy Awards and four Golden Globes. DuVernay recently wrapped production on directing Disney’s “A Wrinkle in Time” based on the beloved children’s novel of the same name; marking the first time an African American woman has directed a feature with a budget over $100 million. The film, which stars Oprah Winfrey, Reese Witherspoon and Mindy Kaling, will be released in March 2018. In 2010, DuVernay founded ARRAY, a film collective which distributes and amplifies the work of people of color and women directors, named one of Fast Company’s Most Innovative Companies in Hollywood. In the contemporary drama “Queen Sugar,” the Bordelon siblings struggle to move forward with their lives as they strive to honor the legacy of their father following his unexpected passing. Charley (Dawn-Lyen Gardner, “Unforgettable”) relocates to Saint Josephine, Louisiana, to help run the family business. As the only black female sugarcane mill owner, she must fight to regain her independence while rebuilding her relationships with her estranged siblings. Ralph Angel (Kofi Siriboe, “Girls Trip”) struggles to transform from a formerly incarcerated single father to a landowner in the eyes of his family as he works to restore his relationship with his son’s mother. Nova (Rutina Wesley, “True Blood”) finds herself torn between her activism and her desire to be loved. Together, they must learn to rely on one another as they navigate their tenuous bonds as family. The expansive cast also includes Tina Lifford (“Parenthood”) as the siblings’ free-spirited Aunt Violet; Omar J. Dorsey (“Ray Donovan,” “Selma”) as Violet’s much younger boyfriend Hollywood Desonier; Dondré T. Whitfield (“Mistresses”) as trusted Bordelon family friend Remy Newell; Timon Kyle Durrett (“Single Ladies”) as Charley’s estranged husband and pro basketball player Davis West; Nicholas L. Ashe (“The Lion King” – National Tour) as Charley and Davis’ teenage son, Micah; Ethan Hutchison (“The Path”) as Ralph Angel’s son, Blue; and Bianca Lawson (“Rogue”) as Darla, Blue’s mother who battles drug addiction. Additionally, guest star Henry G. Sanders (“Rocky Balboa”) recurs as Prosper Denton, a farmer and longtime friend of the late Bordelon family patriarch, Ernest. “Queen Sugar” is produced for OWN by Warner Horizon Scripted Television. The executive producers are Ava DuVernay, Oprah Winfrey and Monica Macer. The series is based on the book by Natalie Baszile. The series’ debut season won an NAACP Image Award for Best Drama Series, Television Show of the Year from both ABFF and AAFCA, and was a People’s Choice Awards nominee for Favorite Cable Drama. Season one is currently available for streaming on Hulu. Season two viewers can catch up on the Watch OWN App and WatchOWN.tv. DuVernay’s handpicked female directing team for season two includes: Garrett Bradley (“Alone”), Kat Candler (“12 Monkeys”), Julie Dash (“Daughters of the Dust”), DeMane Davis (“Lift”), Cheryl Dunye (“Stranger Inside”), Aurora Guerrero (“Mosquita y Mari,”), Amanda Marsalis (“Echo Park”), Maryam Keshavar (“Circumstance”), Liesl Tommy (“Eclipsed”) and Christina Voros (“The Ladies,” “The Director”). What do you think? Are you watching the Queen Sugar TV series? Do you plan to tune in for season three on OWN? So Happy that Greenleaf and Sweet Sugar are being renewed. Please don’t take so long for them to come back again. Yes, I love the show. When does the 3rd season start? I love Queen Sugar and really hope they bring (Greg Vaughan) back as Calvin. . .